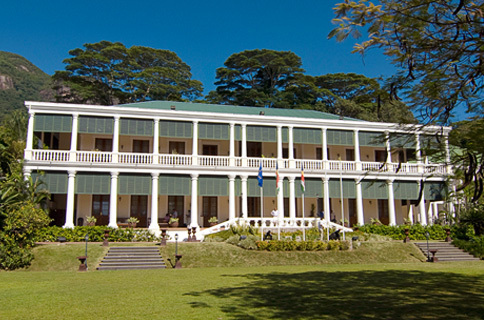 State House is synonymous with the history of Victoria and Seychelles as a whole. It is a monument which is a symbol of the evolution of the Seychellois people and of the forging of their national identity from colonial and immigrant roots. Renovations undertaken as from 2006 were aimed at restoring and preserving the colonial character of State House while also accommodating more modern features. State House is thus simultaneously a reminder of the Seychellois heritage and a contemporary part of Seychelles diplomacy and governance. This sublime and majestic building which is a National Monument was called "Government House" during the years when Seychelles was a British colony and was under the authority of a Governor and his Legislative Council. State House was also the residential home of the governor. The building was designed and built in 1910 by William Marshall Vaudin who was the son of the civil chaplain Adolphus Vaudin. If the two-storied portico ornamented with white pillars is characteristic of Edwardian splendour of that epoch, the design of the building reflects the aesthetics of colonial architecture that then prevailed in the tropical parts of the British Empire. Its first tenant was William Edward Davidson, Seychelles' second Governor. He occupied the house during the last year of his tenure in 1912. In all, sixteen governors and one President have lived here. In 1977, the building ceased to be the home of the chief executive. It became the offices of the Head of State and housed some of the departments and agencies affiliated with the functions of the President. Later, some of the offices under the President moved into a new modern building nearby and State House proper were used as the venue for diplomatic functions. Almost a century after its construction the 'State House' underwent extensive renovations that did not alter its original architectural design. Its colonial charms and stately elegance make it a grand feature of Victoria, and a cherished souvenir of the island's history.